Bronx Borough President Ruben Diaz Jr. (left) voices opposition to a new jail proposal in Mott Haven at a rally on the steps of City Hall on Sunday, Mar. 24. Diego Beekman Houses vice chair Arline Park (center) and Third Avenue Business Improvement District Executive Director Michael Brady (right) and dozens of community leaders and advocates joined Diaz Jr. for the rally. Photo: Pamela Subizar. If Mott Haven gets a new jail as Mayor Bill de Blasio has proposed, it will happen despite fierce opposition from neighborhood residents and Bronx Borough President Ruben Diaz Jr.
On March 24, tenants of the Diego Beekman Mutual Housing Association in Mott Haven joined Diaz on the steps of City Hall in Manhattan to protest the plan, which calls for a 26-story jail with room for 1,437 detainees, to be built on the site of an NYPD tow pound on Concord Avenue. The protesters called on de Blasio to slow down the process and stop the certification of the city’s Uniform Land Use Review Procedure (ULURP). Diaz acknowledged Beekman residents and others from Chinatown, Kew Gardens and the Rockaways for coming out to support the cause. “I wish that we were here for some good news,” said Diaz. “We’re here because we are all trying to address, in different ways, criminal justice and criminal justice reform.” He warned against the city “weaponizing” the ULURP process, and demanded that the city take heed of community input before making any decisions on the site. 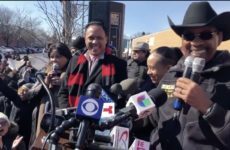 A new jail in Mott Haven runs counter to values that the mayor claims to stand for, Diaz said, and called on New Yorkers to join the fight. Theirs could be the next neighborhood where an unwanted project could be rammed in without residents’ input, he warned. The mayor should provide leadership for his constituents, and not for special interest groups, she said, adding that Beekman Houses residents have worked for decades to make the area safer. 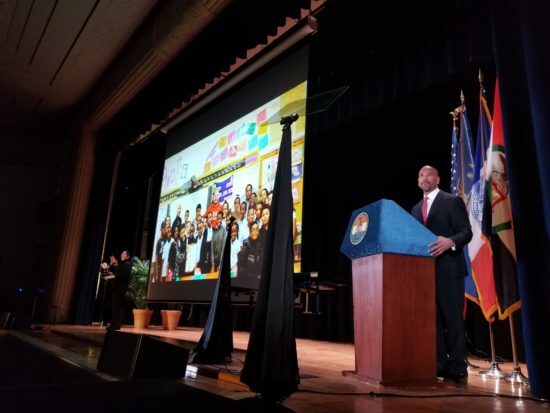 Those residents designed elaborate plans to create schools, affordable housing and youth programming on the site where the tow pound is located, but the mayor is ignoring it, Parks said. Opponents argue that the proposed jail site would create a “jail economy,” hurting small businesses. Michael Brady, executive director of the HUB Third Avenue Business Improvement District, said a jail at the Concord Avenue site would cause local small businesses to fail. The mayor’s own data shows that jails are most sensibly placed near courthouses, Brady said. 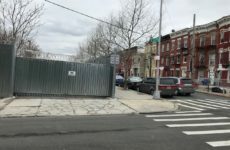 He and others have pointed a new jail would make the most sense being built next to the courthouse on E. 161st Street, where detainees would have quick access to their lawyers, making the court process easier and quicker. “It’s really unfortunate that Bill de Blasio has not built up enough chutzpah to do things the right way,” said Brady. Others argue that siting a jail at the Concord Avenue location would further hurt already sparse public transportation options in the area. Walter Nash, 74, has lived his entire life in a house across from the site. Putting a jail there would increase traffic and take away public parking, Nash said, adding that a jail would affect children in area schools, especially since a new 15-story homeless shelter is also slated to go up soon nearby. Diaz insisted that the Bronx is not saying, “Not In My Backyard,” but rather that the city should stick with a plan that aligns with the data and build a jail closer to the courthouse. The story was updated on March 25.